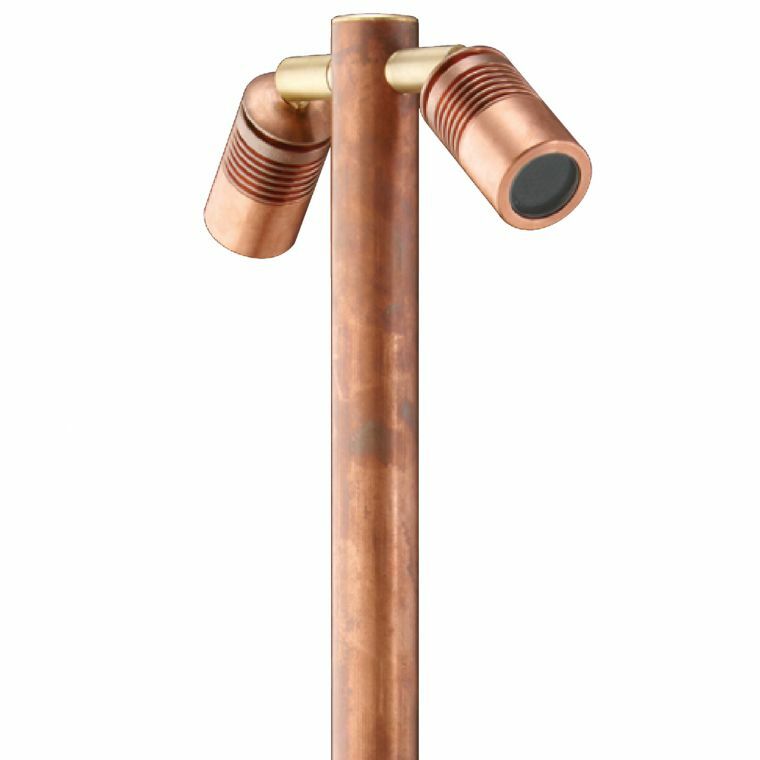 The Euro Twin Pole Lite is ideal for path lighting as well as uplighting of medium sized bushes and shrubs. As it has two heads, it is even possible to do both at the same time! The Euro Twin Pole Lite has been beautifully designed to fully utilise the MR11 Dichroic lamp. It is ideal for exterior lighting when positioning of the luminaire makes it visible, the smaller sized MR11 is designed so it is discreet. The luminaire has two fully adjustable heads allowing for 360 degree rotation and 0 – 90 degree elevation on each. Machined from 45mm thick solid copper or 316 stainless steel, clear tempered glass lenses with high temperature silicon gaskets. The heads are secured by stainless steel grub screws to an 850mm pole. This low voltage landscape lighting product is suitable for use with an MR11 – 5, 10 or 20 watt lamp (max) and is supplied with 2 x 20 watt high quality European 5000 hour lamps and built-in hex cell louvres.